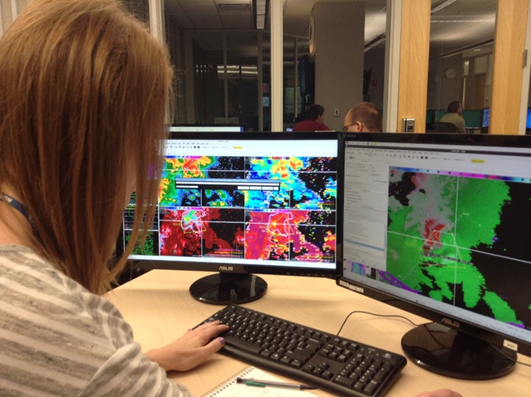 June 29, 2015 – NOAA satellite experts and weather forecasters are working together at the Hazardous Weather Testbed (HWT) in Norman, Oklahoma, to prepare to use data from the GOES-R satellite to improve short-range hazardous weather forecasts and warning decision-making. From May 4 to June 12 (during the height of severe weather season), NOAA invited National Weather Service forecasters and paired them with TV broadcast meteorologists to evaluate the new science, technology and products that will be available from GOES-R, the latest geostationary weather satellite built at Lockheed Martin Corporation’s Littleton, Colorado facility. Each week of the experiment, researchers and forecasters worked side-by-side to evaluate new products and tools and participated in experimental forecast and warning generation exercises. This approach prepares weather forecasters to use the new capabilities that will be available from NOAA’s next generation of weather satellites, the GOES-R series. Participating forecasters found the GOES-R severe weather products and one-minute imagery very helpful when evaluating potential storms and issuing warnings. Holly Obermeier, meteorologist with KETV-TV in Omaha, Nebraska, is excited about the lightning data that will be available from the Geostationary Lightning Mapper, built by Lockheed Martin. The GOES-R satellite will be the first flight of this sophisticated instrument in geostationary orbit and will enable early predictions of intensifying storms and severe weather events. The GOES-R satellite is slated to launch in March 2016 atop a United Launch Alliance Atlas V rocket from Cape Canaveral Air Force Station in Florida. Once launched, the satellite will be known as GOES-16 and will immediately be placed in a test location at 89.5 degrees West longitude for an extended checkout period. During post-launch testing and validation, the GOES-R satellite will provide observations throughout the 2016 hurricane season. At the conclusion of checkout, the satellite permanent location will be determined based on the health and performance of the other GOES satellites in NOAA’s constellation.